Your dress is in, time to make it perfect. Make sure that your dress fits you like a glove. Fitting the bodes and hemming the bottom of the dress with the fabulous Karen herself! I chose to work with Karen Hendrix Couture, she is the exclusive custom couture bridal wedding gown designer in Nashville, Tennessee. You can check her business out by clicking here . Her shop is located at 2021 21st Avenue South, Suite 310, Nashville, Tennessee, 37212. Right away I could tell she must be a great designer as she was booked and I had to schedule my alterations out far in advance in order to get in with her. She told me she taught herself how to sew and we connected over our love of music as she is classically trained and sang all her life, like me! I would love to call her the Fairy God Mother in the couture world. She is so kind and funny and just makes you feel so confident and comfortable. Her space is beautiful as well. She walks you through the process and exactly what needs to be done to your dress. Create mock sleeves in order to create the real sleeve shape. I chose to have custom sleeves put on my dress. We got to chose the design of the fabric and I got to help her with the placement of the appliqué as well as alteration decisions. Karen made sure my vision came to life and she worked hard to make everything perfect. She is a very busy lady but took pictures and voice notes of what needed to be done to my gown so that everything was kept in order. I suggest anyone to go to Karen but make sure you book in advance and allow up to two months of alteration time so that your dress can be perfect. Keep into account that you are not the only bride getting married and that seamstress and designers are very busy people. Do not be the bride who waits until the week before her wedding to go in for alterations. Picking out the perfect locations for the appliqués. Then Karen hand sews on each one, I called her a magician. As far as if you are planning on losing weight or to tone up before the big day. Make sure your weight and body shape is at its best when you go in for alterations. You want to maintain not continue to change or drop weight. You want to be the exact size that you will maintain until the wedding day. Otherwise you will just continue to pay for more alterations if you keep dropping weight. If you are okay with paying more and having to take more time for alterations then you can continue to lose weight. If you want to save yourself money go into your fittings the exact size that you will remain for your wedding day. Appliqués are set onto the sheer sleeve material! The sleeves are coming to life! Bring the exact heels you will wear for your wedding day to your fitting as well. That way the seamstress can hem your dress to the height of your shoes. I personally had no idea the type of bustle I wanted for my gown, so be sure to look online or on Pinterest for different styles of bustling that you could have for your gown. As far as pricing for alterations, it all depends on where you go. Alterations can range anywhere from $200-$1,000. I did not take into account how expensive it could be for custom sleeves. So make sure you are aware of the prices before you commit to custom elements. I would not have changed anything but going into it I wish I knew that I needed two months for custom sleeves and an extra big chunk of money to cover alterations. But lets be honest, who doesn’t love a one of a kind custom wedding dress?! NOT ME! After two months of alterations, my dress still gave me chills when I put it on for the last alteration appointment. 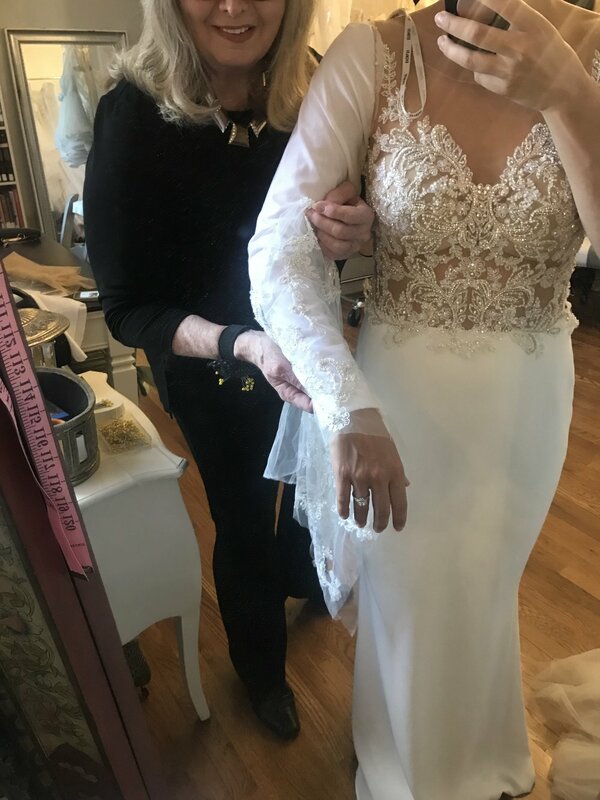 Karen and her staff took their time in showing me how to bustle my gown and even recorded a video so I could show my bridesmaids how to do it. It was technical but worth it. My dream dress came to life with the most beautiful sleeves I had ever seen. It exceeded all expectations. 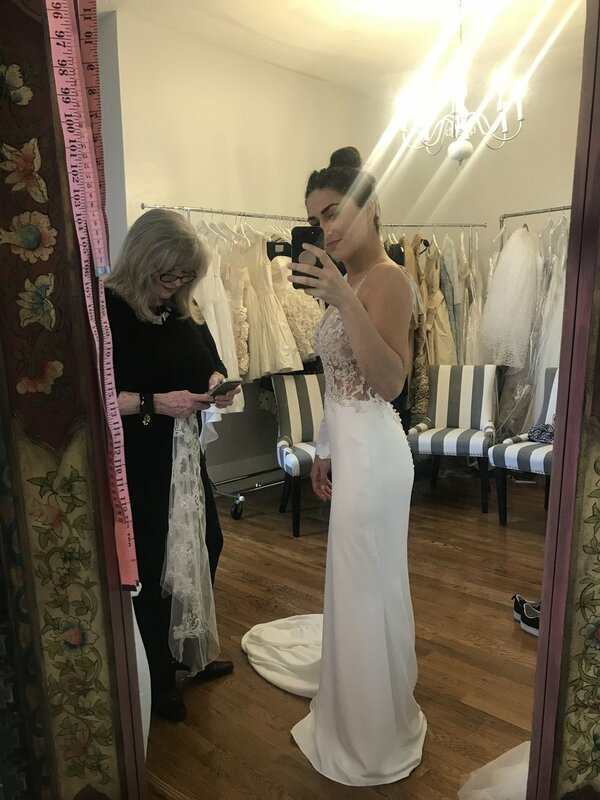 Karen, if you read this you are a phenomenal person and designer and I cannot thank you enough for making my dream dress complete. Week of the wedding the only thing I had to do was have it steamed, I called a wedding dress shop in my hometown and they had me pay $40 to steam my dress.